News out at San Diego Comic Con that Grant Morrison’s going to be taking over/relaunching Green Lantern. 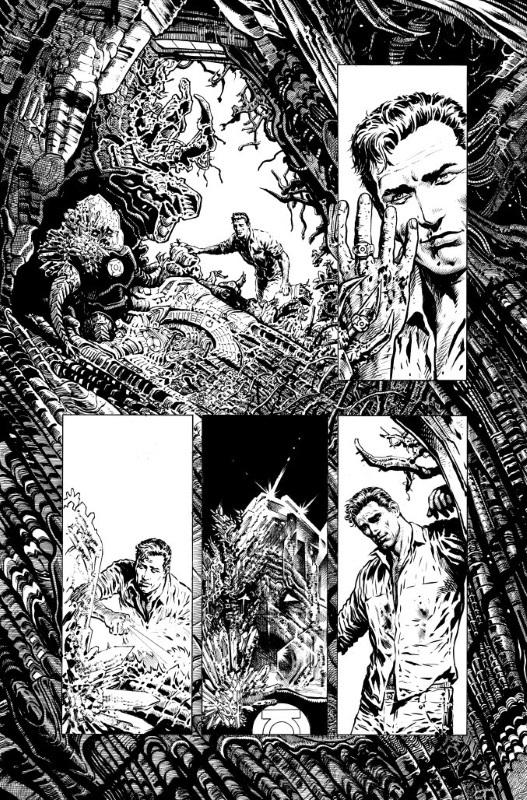 The news item has a bunch of pages by artist Liam Sharp and while the art looks good, it raises a couple of questions. This really looks like a new origin – that Green Lantern handing over his power battery to Hal sure isn’t the Abin Sur we’re all used to, and I wonder how that’s going to impact the story. DC is still (mostly) enjoying the success of the Rebirth initiative and this seems to fly in the face of it. Morrison writing GL doesn’t particularly excite me – I’ve never been a massive fan of his stuff, nor have I hated it. I’ve said before now he’s great at the big ideas side of things but often doesn’t finish them well; Final Crisis is, to me, a good example of that, where it started out with a clear cut story about the death of a New God and the triumph of Darkseid and then spun out to include some evil Monitor vampire thing. I’ll be giving this new title a go regardless as I’ll read pretty much anything in the GL family and will see what happens. Posted on Saturday, July 21, 2018 Monday, October 15, 2018 by GaryPosted in NewsTagged Green Lantern (Hal Jordan). Yeah I noticed that too. Looks like not only is DC continuing to copy Marvel with the constant renumbering and relaunching, but now we’ve got what is essentially a soft reboot of Hal and history. I’m not shiting on it, especially since I like Morrison’s work, but this seems like another pointless restart. Did they really need a new shiny #1? No. I will say though, as much as I like Abin Sur and all, this time the dying alien that gives Hal his ring actually LOOKS like an actual alien instead of a guy who looks like he was painted in beet juice. I don’t doubt the stories will be fun to read though, even if this whole police procedural thing sounds a lot like Moore’s Top 10 cop series. Haha! Yeah, they definitely went for the Star Trek style of alien where it’s basically a bloke with different coloured skin! Although, to be fair, the later alien GLs included some real alien types – Chaselon and Medphyl spring to mind. Thinking about it, part of the problem with the reboot is if that is Abin Sur, then it seems less likely that Sinestro will have had a relationship with Abin’s sister, which negates a big part of Sinestro’s early years and motivations. Because the GL stories are so big and involve so many characters, doing something as potentially significant as this will have ramifications. Does this mean the last couple of years since Rebirth haven’t happened/happened differently? I know Dan Didio and Jim Lee have said that they want the stories to be the driver, not continuity, but it sounds like they want to have their cake and eat it. Good question. I guess we’ll have to wait and see how the series goes. It’ll either loosely be connected to the DCU as a whole or completely be it’s own thing which I don’t see happening. It’s a good thing I’ve stopped caring and collecting, otherwise I’d be constantly frustrated by the constant changes and reboots every the whim strikes them. I remember when reboots didn’t happen every 6-8 months, back when there was a long and steady plan for continuity. I guess like everything else those days are long gone. As much as I try and take the stories on their own merit, comics have such a long history of being interconnected that continuity can’t help but raise it’s head. It’s very difficult not to think “But if character A no longer knows character B, what about their child, character C who’s still around” or whatever. I get the whole refresh thing – comic companies have to make money and they want to encourage new readers without burdening them with decades of continuity – but that very interconnectedness is what attracts many readers. It’s a tricky balancing act. It is and I understand that, but still, that’s why it’s so important to handle that balancing act the smart way rather than just changing it on a whim every so often.